I took this picture of him on Pioneer Day (July 24) when I realized that my little vampire baby would soon be replaced by an ordinary baby. 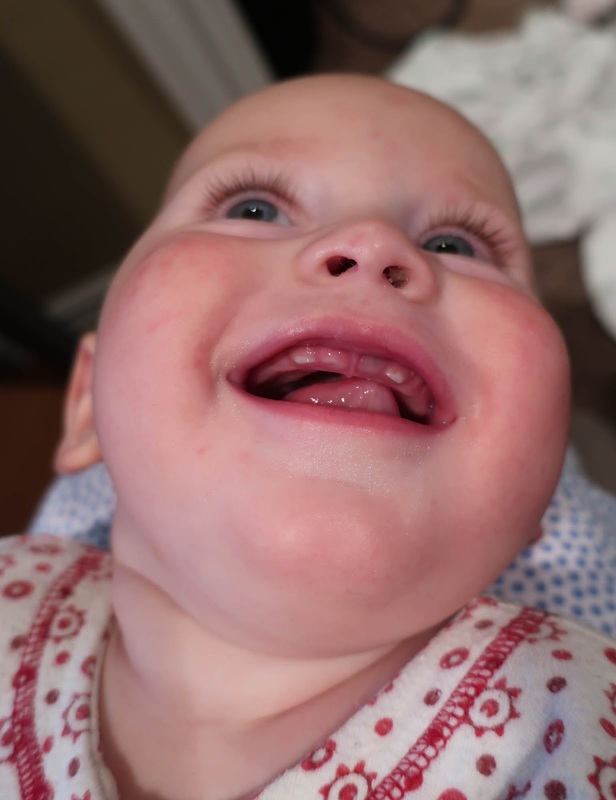 His right front tooth popped in within a few days of taking this picture but that left tooth is taking its sweet time. Alexander loves food but will often refuse to eat when a tooth is about to erupt. He'll clamp his mouth shut and turn his head away to avoid opening his mouth. And forget about looking inside. You won't be able to coax him to open his mouth and you won't be able to pry it open with your fingers, either. He's rather serious about hiding away his teeth. The only way you'll get a peek is if you can make him laugh (I tickled him to get this shot...and it's not a very attractive picture of him (sorry, buddy)). Hopefully he'll be back to his happy little self again soon!